Help a Patriot on the 4th of July! Darcy Burner is amazing. She’s running for House Seat WA-08. She narrowly lost two years ago, and she’s back again to finish the job. Why should we, in Alaska, care about what’s going on in a house race in Washington? The only thing I can say is that if elected, Darcy Burner will be a representative on the order of Robert Wexler, and Dennis Kucinich…in other words, a member of congress who is looking out not only for her constituents, but for the Constitution and the country as a whole, including you and me. She’s smart, capable, organized, driven, unaffected and imho, the genuine article. She saw that the newly elected Democratic majority didn’t actually have a plan for ending the war in Iraq in a responsible way, so….she did the research, talked to people in the know, including retired Major General Paul Eaton (Petreus’ predecessor) and wrote the plan herself – a 36-page manifesto called A Responsible Plan to End the War in Iraq. You can read it HERE. And if 36 pages is too much for you, you can get the gist by watching the 5-minute clip. The thing I love is that not only does she talk about what we need to do over THERE, she talks about what we need to fix structurally on THIS end to keep it from happening again, like eliminating presidential ‘signing statements’, and phasing out the use of armed miliatry contractors like Blackwater. Watch it and you will want to elect her, and then clone her, and then elect her clone. Yesterday, Darcy Burner, lost her house and everything in it, in a fire that started from faulty wiring in a lamp in her 5-year old’s bedroom. Fortunately her family all survived, including her son’s puppy who was rescued by fire fighters. Her cat, her home and everything in it didn’t make it. 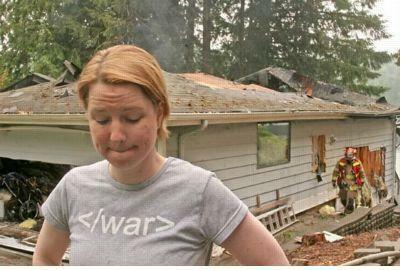 If anyone had any doubts about this woman’s integrity and sincerity, the t-shirt she was wearing when she and her family ran out of their burning house at 3 in the morning said, simply: </war> That’s XML for “End War”. She was a manager for Microsoft, can you tell? We all know the brutal truth about effective campaigning, which basically boils down to the fact that if you’re awake, you’ve got to be focused on fund-raising. This tragedy would set any of us back on our heels for a little while. Darcy has plenty on her plate right now without worrying about the rigors of fundraising. So, if you’re feeling like doing a good deed this fourth of July to benefit someone who’s giving her all to make this country all it should be, consider making a donation of whatever size you can to Darcy’s campaign. The more donations she receives from people like us, the more time she can take to recuperate, focus on her family, and get her life back in order before she’s back on the campaign trail. Wave a flag, eat a burger, and click HERE to support a patriot in need. Comments : Comments Off on Help a Patriot on the 4th of July!